A novel function for proSAAS as an amyloid anti-aggregant in Alzheimer's disease. 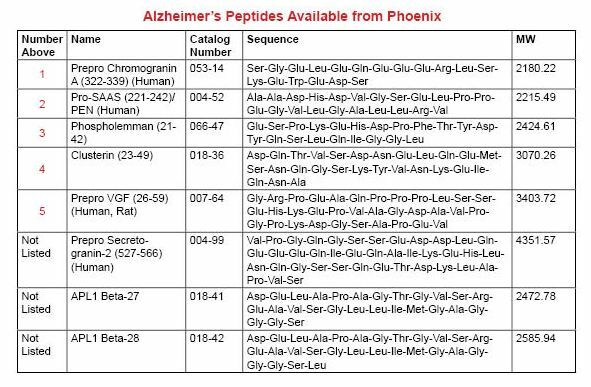 Neurodegenerative diseases such as Alzheimer's disease (AD) are characterized by an abnormal aggregation of misfolded beta-sheet rich proteins such as β-amyloid (Aβ). Various ubiquitously expressed molecular chaperones control the correct folding of cellular proteins and prevent the accumulation of harmful species. We here describe a novel anti-aggregant chaperone function for the neuroendocrine protein proSAAS, an abundant secretory polypeptide that is widely expressed within neural and endocrine tissues and which has previously been associated with neurodegenerative disease in various proteomics studies. In the brains of 12-month-old APdE9 mice, and in the cortex of a human AD-affected brain, proSAAS immunoreactivity was highly colocalized with amyloid pathology. Immunoreactive proSAAS co-immunoprecipitated with Aβ immunoreactivity in lysates from APdE9 mouse brains. In vitro, proSAAS efficiently prevented the fibrillation of Aβ1-42 at molar ratios of 1 : 10, and this anti-aggregation effect was dose dependent. Structure-function studies showed that residues 97-180 were sufficient for the anti-aggregation function against Aβ. Finally, inclusion of recombinant proSAAS in the medium of Neuro2a cells, as well as lentiviral-mediated proSAAS over-expression, blocked the neurocytotoxic effect of Aβ1-42 in Neuro2a cells. Taken together, our results suggest that proSAAS may play a role in Alzheimer's disease pathology. In this study, we describe a novel anti-aggregant function for the neuroendocrine protein, proSAAS. We found that proSAAS co-localizes with Aβ in Alzheimer's disease-affected brains, and co-immunoprecipitates with Aβ in brain extracts. In vitro, proSAAS efficiently prevents Aβ1-42 fibrillation, and also blocks Aβ1-42 -mediated neurotoxicity. These results suggest that proSAAS may be a novel target for neurodegenerative disease therapy. Hoshino A, Helwig M, Rezaei S, Berridge C, Eriksen JL, Lindberg I. J Neurochem. 2014;128(3):419-30. Multiple peptide systems, including neuropeptide Y, leptin, ghrelin, and others, are involved with the control of food intake and body weight. The peptide LENSSPQAPARRLLPP (BigLEN) has been proposed to act through an unknown receptor to regulate body weight. In the present study, we used a combination of ligand-binding and receptor-activity assays to characterize a Gαi/o protein-coupled receptor activated by BigLEN in the mouse hypothalamus and Neuro2A cells. We then selected orphan G protein-coupled receptors expressed in the hypothalamus and Neuro2A cells and tested each for activation by BigLEN. G protein-coupled receptor 171 (GPR171) is activated by BigLEN, but not by the C terminally truncated peptide LittleLEN. The four C-terminal amino acids of BigLEN are sufficient to bind and activate GPR171. Overexpression of GPR171 leads to an increase, and knockdown leads to a decrease, in binding and signaling by BigLEN and the C-terminal peptide. In the hypothalamus GPR171 expression complements the expression of BigLEN, and its level and activity are elevated in mice lacking BigLEN. In mice, shRNA-mediated knockdown of hypothalamic GPR171 leads to a decrease in BigLEN signaling and results in changes in food intake and metabolism. The combination of GPR171 shRNA together with neutralization of BigLEN peptide by antibody absorption nearly eliminates acute feeding in food-deprived mice. Taken together, these results demonstrate that GPR171 is the BigLEN receptor and that the BigLEN-GPR171 system plays an important role in regulating responses associated with feeding and metabolism in mice. Gomes I, Aryal DK, Wardman JH et al., Proc Natl Acad Sci U S A. 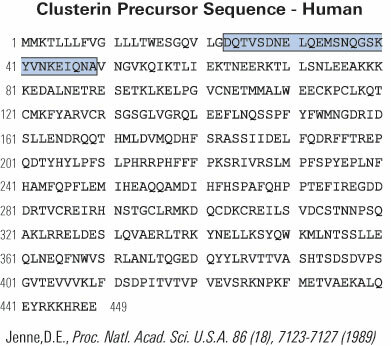 2013 Oct 1;110(40):16211-6. doi: 10.1073/pnas.1312938110. Epub 2013 Sep 16. Peptide fingerprinting of Alzheimer's disease in cerebrospinal fluid: identification and prospective evaluation of new synaptic biomarkers. BACKGROUND: Today, dementias are diagnosed late in the course of disease. Future treatments have to start earlier in the disease process to avoid disability requiring new diagnostic tools. The objective of this study is to develop a new method for the differential diagnosis and identification of new biomarkers of Alzheimer's disease (AD) using capillary-electrophoresis coupled to mass-spectrometry (CE-MS) and to assess the potential of early diagnosis of AD. METHODS AND FINDINGS: Cerebrospinal fluid (CSF) of 159 out-patients of a memory-clinic at a University Hospital suffering from neurodegenerative disorders and 17 cognitively-healthy controls was used to create differential peptide pattern for dementias and prospective blinded-comparison of sensitivity and specificity for AD diagnosis against the Criterion standard in a naturalistic prospective sample of patients. Sensitivity and specificity of the new method compared to standard diagnostic procedures and identification of new putative biomarkers for AD was the main outcome measure. CE-MS was used to reliably detect 1104 low-molecular-weight peptides in CSF. Training-sets of patients with clinically secured sporadic Alzheimer's disease, frontotemporal dementia, and cognitively healthy controls allowed establishing discriminative biomarker pattern for diagnosis of AD. This pattern was already detectable in patients with mild cognitive impairment (MCI). The AD-pattern was tested in a prospective sample of patients (n=100) and AD was diagnosed with a sensitivity of 87% and a specificity of 83%. Using CSF measurements of beta-amyloid1-42, total-tau, and phospho(181)-tau, AD-diagnosis had a sensitivity of 88% and a specificity of 67% in the same sample. 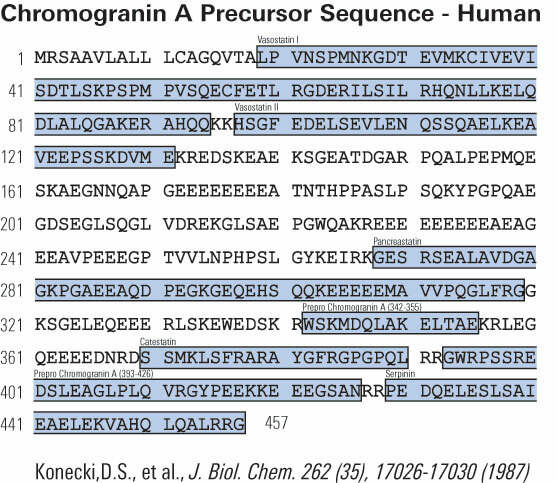 Sequence analysis of the discriminating biomarkers identified fragments of synaptic proteins like proSAAS, apolipoprotein J, neurosecretory protein VGF, phospholemman, and chromogranin A. CONCLUSIONS: The method may allow early differential diagnosis of various dementias using specific peptide fingerprints and identification of incipient AD in patients suffering from MCI. Identified biomarkers facilitate face validity for the use in AD diagnosis. Shown are the ROC analyses of all biomarkers. In the table unique internal protein-ID, mass, CE-migration time, observed frequency of occurrence, the corresponding mean amplitudes, and AUC values (as a biomarker quality measure) in the different groups for the final peptide panels. 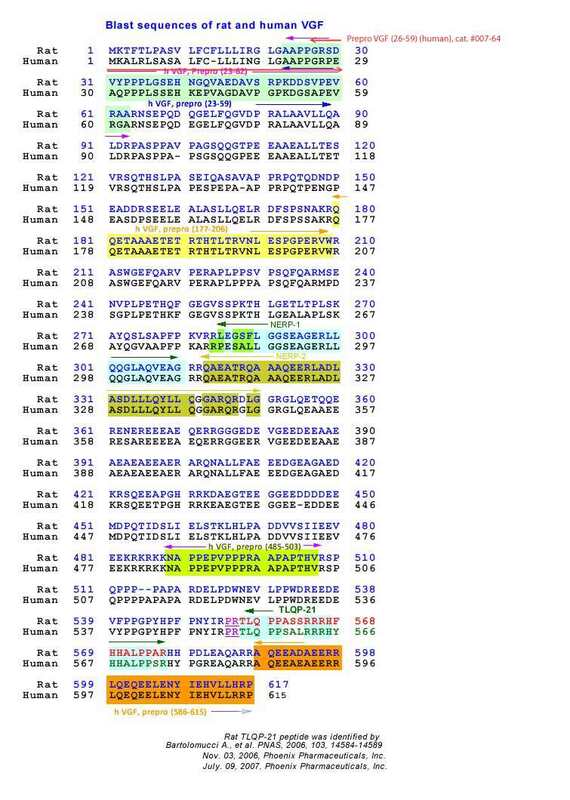 Five peptides, which are marked in yellow, are already identified . Jahn H, et al., PLoS One. 2011;6(10):e26540. Epub 2011 Oct 26. ProSAAS-Derived Peptides are Colocalized with Neuropeptide Y and Function as Neuropeptides in the Regulation of Food Intake. ProSAAS is the precursor of a number of peptides that have been proposed to function as neuropeptides. Because proSAAS mRNA is highly expressed in the arcuate nucleus of the hypothalamus, we examined the cellular localization of several proSAAS-derived peptides in the mouse hypothalamus and found that they generally colocalized with neuropeptide Y (NPY), but not a-melanocyte stimulating hormone. However, unlike proNPY mRNA, which is upregulated by food deprivation in the mediobasal hypothalamus, neither proSAAS mRNA nor proSAAS-derived peptides were significantly altered by 1-2 days of food deprivation in wild-type mice. Furthermore, while proSAAS mRNA levels in the mediobasal hypothalamus were significantly lower in Cpe(fat/fat) mice as compared to wild-type littermates, proNPY mRNA levels in the mediobasal hypothalamus and in other subregions of the hypothalamus were not significantly different between wild-type and Cpe(fat/fat) mice. Intracerebroventricular injections of antibodies to two proSAAS-derived peptides (big LEN and PEN) significantly reduced food intake in fasted mice, while injections of antibodies to two other proSAAS-derived peptides (little LEN and little SAAS) did not. Whole-cell patch clamp recordings of parvocellular neurons in the hypothalamic paraventricular nucleus, a target of arcuate NPY projections, showed that big LEN produced a rapid and reversible inhibition of synaptic glutamate release that was spike independent and abolished by blocking postsynaptic G protein activity, suggesting the involvement of a postsynaptic G protein-coupled receptor and the release of a retrograde synaptic messenger. Taken together with previous studies, these findings support a role for proSAAS-derived peptides such as big LEN as neuropeptides regulating food intake. Wardman, JH et al., PLoS One. 2011;6(12):e28152. Epub 2011 Dec 2.